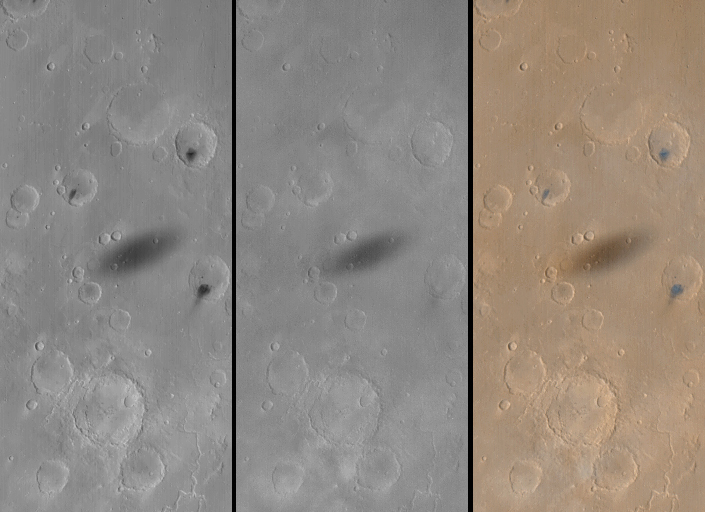 The shadow of the martian moon, Phobos, has been captured in many recent wide angle camera views of the red planet obtained by the Mars Global Surveyor (MGS) Mars Orbiter Camera (MOC). Designed to monitor changes in weather and surface conditions, the wide angle cameras are also proving to be a good way to spot the frequent solar eclipses caused by the passage of Phobos between Mars and the Sun. The first figure (A, above), shows wide angle red (left), blue (middle), and color composite (right) views of the shadow of Phobos (elliptical feature at center of each frame) as it was cast upon western Xanthe Terra on August 26, 1999, at about 2 p.m. local time on Mars. The image covers an area about 250 kilometers (155 miles) across and is illuminated from the left. The meandering Nanedi Valles is visible in the lower right corner of the scene. Note the dark spots on three crater floors--these appear dark in the red camera image (left) but are barely distingished in the blue image (middle), while the shadow is dark in both images. The spots on the crater floors are probably small fields of dark sand dunes. The second figure (B, above), shows three samples of MOC's global image swaths, each in this case with a shadow of Phobos visible (arrow). The first scene (left) was taken on September 1, 1999, and shows the shadow of Phobos cast upon southern Elysium Planitia. The large crater with dark markings on its floor at the lower right corner is Herschel Basin. The second scene shows the shadow of Phobos cast upon northern Lunae Planum on September 8, 1999. Kasei Valles dominates the upper right and the deep chasms of Valles Marineris dominate the lower third of the September 8 image. The picture on the right shows the shadow of Phobos near the giant volcano, Olympus Mons (upper left), on September 25, 1999. Three other major volcanoes are visible from lower-center (Arsia Mons) and right-center (Pavonis Mons) to upper-middle-right (Ascraeus Mons). Phobos and the smaller, more distant satellite, Deimos, were discovered in 1877 by Asaph Hall, an astronomer at the United States Naval Observatory in Washington, D.C. Hall had been hunting for martian satellites for some time, and was about to abandon the search when he was encouraged by his wife to continue. In honor of her role, the largest crater on Phobos was named Stickney, her maiden name. Phobos is a tiny, potato-shaped world that is only about 13 km by 11 km by 9 km (8 mi by 7 mi by 6 mi) in size. If you could stand on Mars and watch Phobos passing overhead, you would notice that this moon appears to be only about half the size of what Earth's Moon looks like when viewed from the ground. In addition, the Sun would seem to have shrunk to about 2/3 (or nearly 1/2) of its size as seen from Earth. Martian eclipses are therefore dark but not as spectacular as total solar eclipses on Earth can be. In compensation, the martian eclipses are thousands of times more common, occuring a few times a day somewhere on Mars whenever Phobos passes over the planet's sunlit side. Due to the changing geometry of the MGS orbit relative to that of Phobos, the shadow is actually seen in MOC global map images (like in B, above) about a dozen times a month. The shadow of Phobos was seen during the Viking missions in the late 1970s, and in fact one day the shadow was observed to pass right over the Viking 1 lander. The surface of Phobos itself was first imaged by Mariner 9 in 1971, and global coverage was obtained by the Viking orbiters in 1976-80. Phobos was the target of the ill-fated Phobos 1 and Phobos 2 spacecraft, launched by the Soviet Union in 1988. Phobos 2 actually reached Mars in 1989 and obtained a few pictures of the satellite---it also captured the shadow of Phobos cast upon the martian surface using its thermal infrared imager, Termoskan. More recently, the MGS MOC observed the tiny moon four times in August and September 1998. Acknowledgments: B. Cantor in conjunction with MOC Participating Scientist P. James of the University of Toledo (Ohio) first began to notice the Phobos shadows in MOC images while doing a systematic search for recent dust storms. M. Caplinger (MSSS) contributed some of the text for this article.